Multilateral development banks (MDBs) can play a critical role in limiting climate change and helping communities adapt to its impacts. Since 2011, they have provided nearly $200 billion in finance for climate change mitigation and adaptation  (so-called “climate finance”). The World Bank Group’s recent announcement  that it will increase its climate-related investments means this number is likely to grow. But while climate finance is important, it makes up less than a quarter of all finance provided by the MDBs. The rest goes to activities that may (or may not) undermine climate goals. 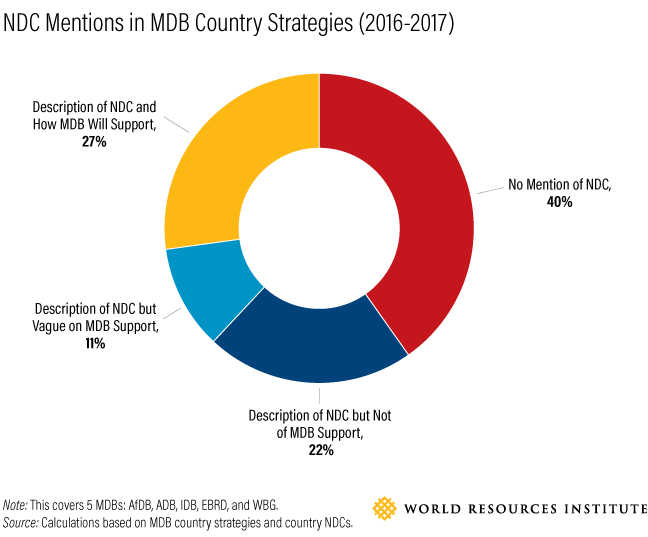 If we are going to have a fighting chance at meeting climate goals, MDBs must make sure not only that their climate finance investments support climate objectives, but also that no other MDB investments undercut them. The banks should transition from what we call a “climate finance paradigm”—based on defining, measuring, and meeting climate finance targets—to a “Paris alignment paradigm” which seeks alignment of entire portfolios with the Paris Agreement. On December 3, 2018, the MDBs pledged to develop a new approach  aimed at facilitating this transition. A report launched  at the climate negotiations in Katowice, Poland, outlines four key steps that the MDBs should take as they work towards operationalizing the Paris alignment paradigm. These include: aligning their investments with net-zero CO2 emissions, mainstreaming climate change resilience, supporting and enhancing country climate goals, and ensuring transparency on the Paris alignment of their activities. Climate change is already here, and it will worsen over the next decades even with aggressive emissions reductions. All investments should be designed with this in mind. Projects should consider both long- and short-term climate risks under different climate scenarios. While project developers should work towards ambitious global temperature targets, they should prepare for scenarios of 3-4°C of warming  by the end of this century. Nationally Determined Contributions (NDCs) outline each country’s contribution to reaching global climate goals, and so are central to the Paris Agreement. Current NDCs vary in their ambition levels and the degree to which they align with other government policies, plans, and regulations. Taken together, the NDCs don’t yet add up to the greenhouse gas reductions necessary to reach the global temperature goal—creating what some have called the “emissions gap.”  Developing countries now need help financing, implementing, and enhancing their commitments.